As ticketing and fundraising seasons reach their peaks, some users who have no interest in those areas get tired of seeing all those posts. 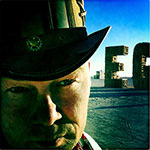 Others may simply not want to see posts related to commerce on ePlaya. You can opt out of those discussions and effectively turn off your access to those sections of the site. We've done it using two specialized user groups. Joining the Show No Tickets group will opt you out of the Event Tickets category (and all the subforums). Joining the Show No Support group will opt you out of the Show Your Support category (which includes the fundraising and commerce subforums). You can join either one or both if you like. If you want to opt back in (for example, after the summer ticket madness dies down), just resign from the respective group. 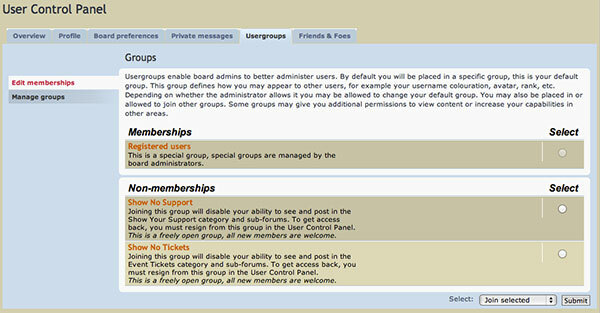 Here is the Usergroups tab of the User Control Panel. It shows the two 'Show No' groups in the Non-Membership section. To join one of the groups (and 'opt out' of or turn off your access to the respective category), select the radio button on the right for the group you'd like and then choose 'Join Selected' from the menu on the bottom right of the page. Once you've joined the group, it will appear under your group memberships. To resign from a group (and turn your access back on), select the radio button on the right from the group and then choose 'Resign Selected' from the menu on the bottom right of the page.